Survey says? 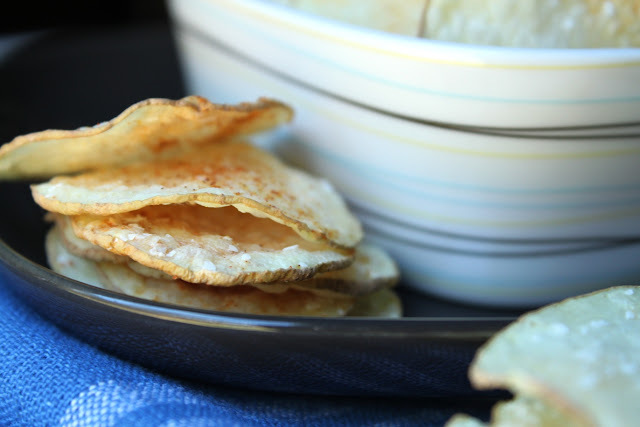 For anyone wanting a good salty and crunchy snack without the extra yuck from frying, these little babies so fit the bill. 1. Cut the potato in half. Slice one half on a mandoline, aiming for slices 1/8 to 1/16-inch thick. Immediately put the slices in cold water. 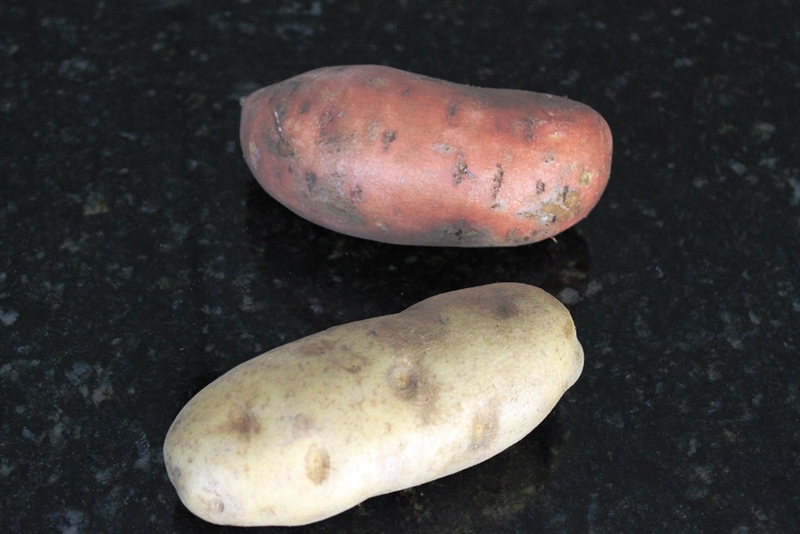 Repeat with the other half of the potato and any other potatoes you are preparing. 2. Rinse the slices in cold water until the water stays clear. If you have time, let them soak for a few extra minutes before rinsing. 3. 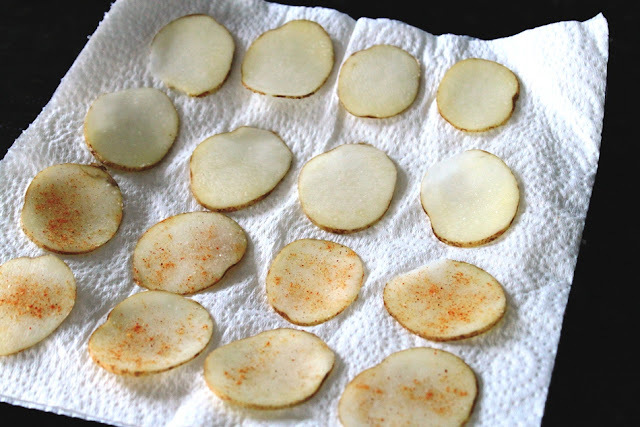 Dry the slices between two clean dish cloths or spin them in a salad spinner. 4. Arrange as many slices as will fit in a single layer on a dinner plate lines with a few paper towels. Make sure the slices do not touch or else they stick together. If desired, sprinkle with salt or other spices. 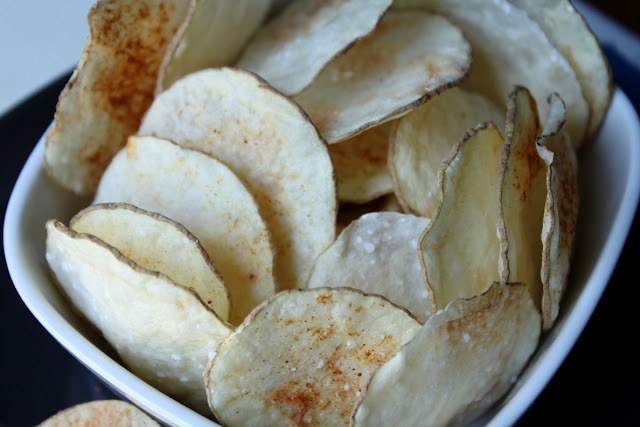 For richer-tasting chips, brush the slices with olive oil first. 5. Microwave the slices at 100% power for 3 minutes. Flip them over and microwave at 50% power for another 3 minutes. 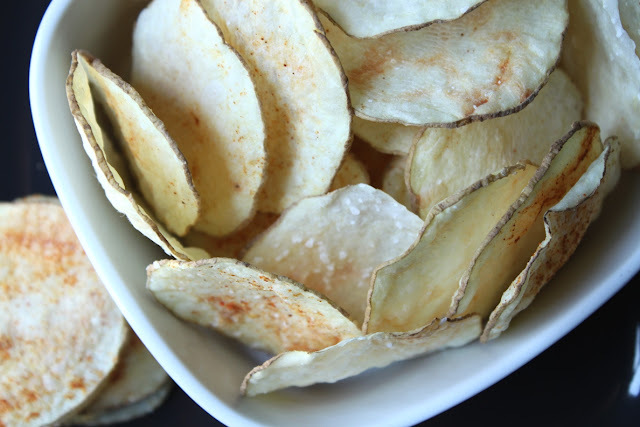 Remove any chips that are starting to crisp and brown. 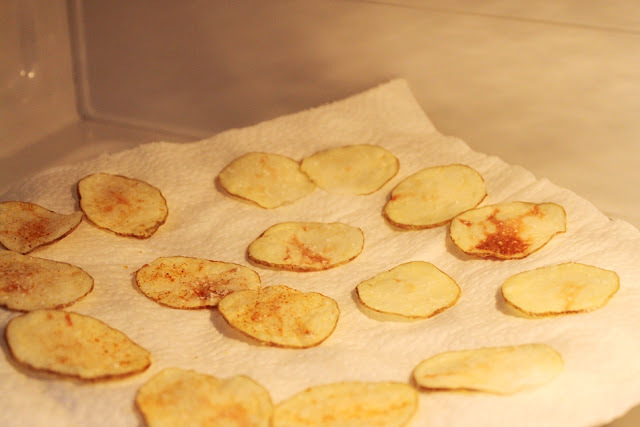 Continue cooking the remaining chips at 50% power in 1 minute intervals until they are all crispy and golden. 6. 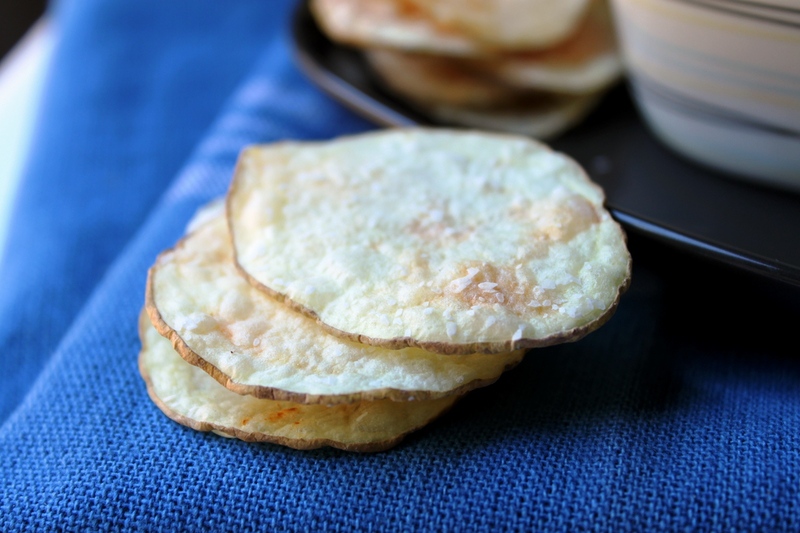 Transfer cooked chips to a bowl and repeat microwaving with the remaining slices of potato. Note: Chips will stay crispy for a few days if kept in an airtight container or zip-lock bag. You can also prepare the raw slices ahead of time, store them in cold water in the refrigerator, and bake them off as you want them. 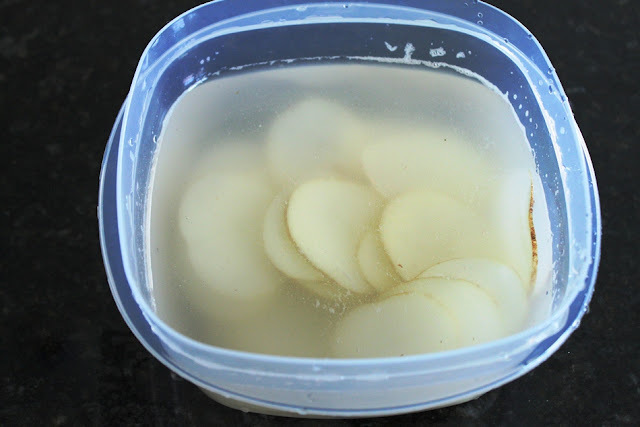 Soaking and rinsing the potato slices will help get starch out. Lay the potato slices in a clean dish towel to pat dry. 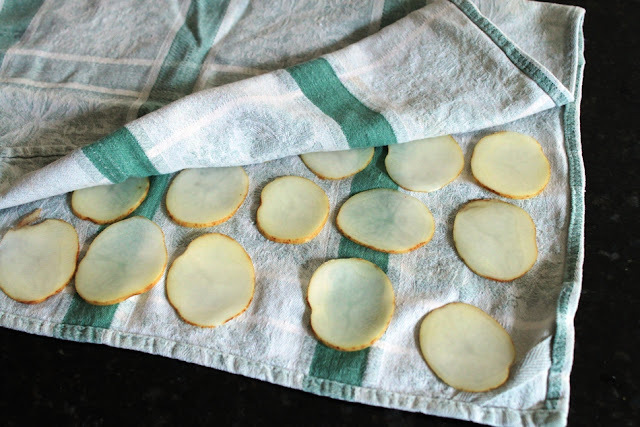 Arrange some of the potato slices on 3 layers of paper towels on a heat-safe plate. Sprinkle with salt or seasonings. Microwave at 100% power for 3 minutes, then flip over. Microwave at 50% power for another 3 minutes. Continue at 50% power until golden and crisp. Yummy! And maybe even healthy??? Or at least not as unhealthy as regular chips. Looks like when I go cake pop supply shopping I'll be picking up a potato or two also! Well, I know what I'm making for game night this week! I'll let you know how it goes.